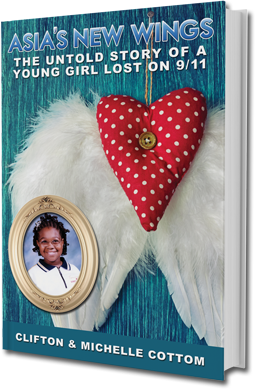 Clifton and Michelle Cottom, parents of Asia Cottom, who died in the September 11 terrorist attacks, are re-launching their book Asia’s New Wings on August 25, 2015. (PRWEB) July 21, 2015 Asia’s New Wings will re-launch on August 25th, 2015. Asia was aboard Flight 77 that crashed into the Pentagon on the fateful morning. On her way to an exciting school trip to California, she was just 11 years old at the time of her death. Now, her story is told through her parent’s recollection of her love, laughter and light. Asia’s New Wings offers hope to others who have sustained loss and illuminates Asia’s love of learning and wishes for the happiness of others.